The important topic of connectivity protocols was discussed in our previous IoT post, it is time to dive deeper into the telecommunications protocols underneath. The fact is that the technologies that enable the IoT architecture need to assume low power at the same time as the transmission via the long distances (meaning - lower frequencies). For example, if we need to cover a field, a campus, an entire building or turning a city smart, we will need a specific communication protocol. The truth is that ZigBee and 6LoWPAN do create a low-power and low-cost WPANs, but since the assets can be distributed in an pretty wide area - we need to include another variable to the equation: the range. 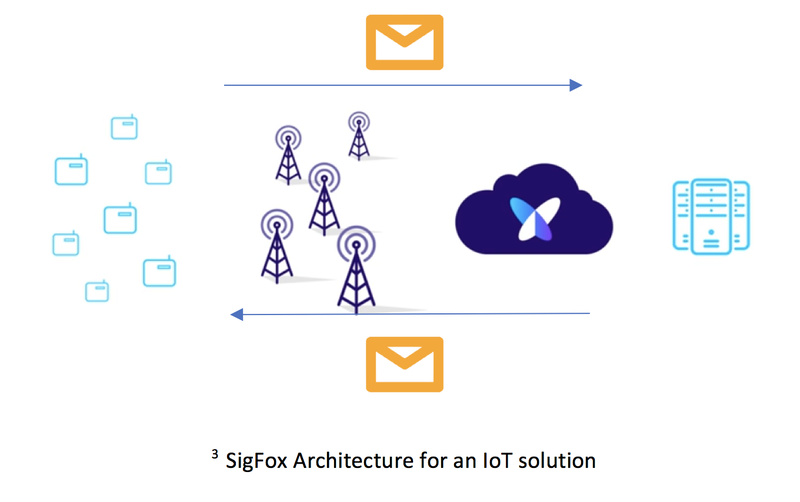 As you can appreciate, there are two new agents in the network ecosystem: LoRaWAN and SigFox. Both are called LPWAN and as you can realise they cover from 150 to 500 times in suburban or rural areas (respectively) the maximum range that ZigBee is offering. These two characters have been competitors in the LPWAN space for several years. The business models and technologies they use are different, but the targets are very similar: mobile networks adopting their technology to deploy IoT solutions. 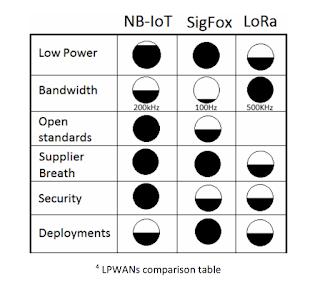 Even though LoRa and SigFox serve similar markets, the first option is more likely if you need bidirectionality, because of the symmetric link (if you need to command-and-control functionality, like an electric grid monitoring). However, for applications that send only small and infrequent bursts of data (like alarms and meters) I would recommend the second one or ultra-narrow band technology that can hold a 2-way transport message as well (3*). 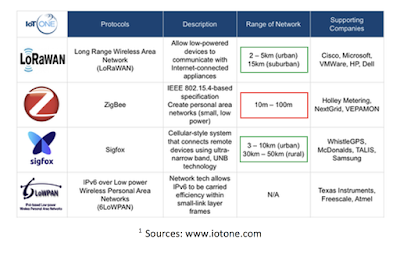 When we talk about mobile networks we can’t forget talking about NB-IOT: a LPWAN Narrow-Band radio technology standard that has been developed to enable a wide range of devices and services to be connected using cellular telecommunications bands. It has been designed for the IoT, standardised by the 3rd Generation Partnership Project (3GPP), a collaboration between groups of telecommunications associations. To sum up all this content let’s group it into a table that explains qualitatively the LPWANs takeaways (4*). 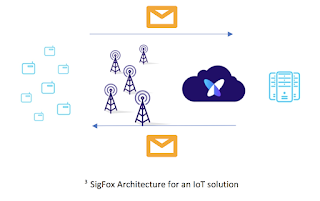 SigFox : extremely low power and bandwidth, kind of open standard due to you have to use their own network, easily tradable, limited security but it’s got some and lot of deployments. NB-IoT: a technology that mobile operators carry on, very low-power and bandwidth, similar to SigFox but not as deployed as the ultra-narrow band network, it is an open standard because it is part of the 3GPP, lots of suppliers because it is open, solid security and authentication and some deployments (Vodafone with Huawei did the first commercial PoC that took place in Madrid using Vodafone Spain’s network on the September 19th 2016). 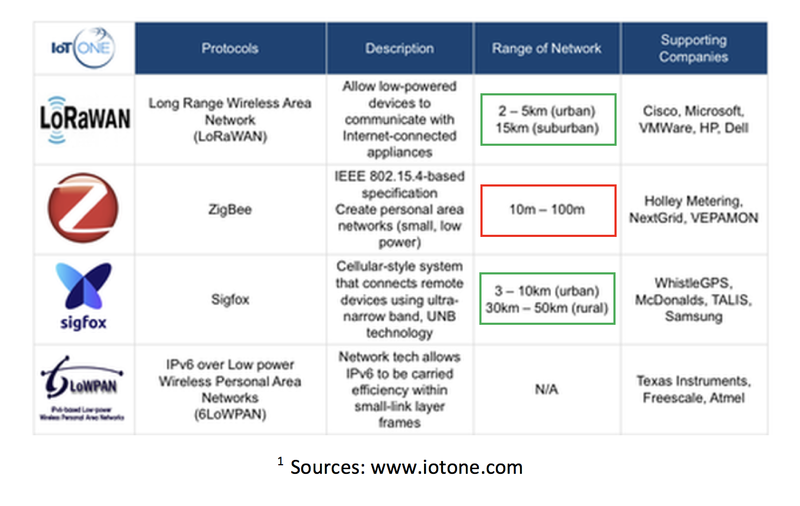 There is another network called LTE-M (Long Term Evolution-Machine) that is pretty similar (open standard as well) to NB-IoT: not as power efficient as NB-IoT but best security. Low deployments but they are going to grow exponentially hand in hand with NB-IoT. The question is: which of these is the IoT network of the future? Will LoRa and SigFox be able to survive if 5G standard includes the IoT-WAN? IoT is a big market, in our opinion - there´s a place for everyone, we just need to wait and see what happens.